Uplifting, Fun, Humbling, Exhilarating, Inspiring & Exhausting: All Rolled into One Great Weekend! You might be wondering where I went on vacation. No, this was not a vacation but an Ataxia Conference. Many might not know about Ataxia. I didn’t until I spoke at an Atlanta chapter support group meeting. I am amazed by how many serious chronic illnesses there are that go unheard of. Ataxia is a set of symptoms caused by a dysfunction in the cerebellum. It causes uncontrolled, uncoordinated movements in gate, arms, eyes, or speech. There are many different types and effects both young and old. Check out this short video clip recorded by Dana Mauro, the partner of someone who has Ataxia. I had the honor of participating fully in this event: Speaking to 500 people (it was a blast! ), running a support group, training the support group leaders, and leading an adaptive yoga class. Guess I am a woman of many talents! At the conference, I saw many in wheelchairs, scooters, using service dogs, canes, and walkers. I saw smiles, laughter, community, fun, families, support, appreciation, and joy. Both loved ones and those with the illness chose to embrace the weekend keeping the focus on solution, rather than the problem. This reminded me of a Viktor Frankl quote: “Everything can be taken from a man or a woman but one thing: the last of human freedoms to choose one’s attitude in any given set of circumstances, to choose one’s own way.” That is exactly what I noticed at the conference. The choice enjoy the conference and work around their limitations. Their illness did not define them, but was part of who they are. What also struck me was how vital it is to have community support and simple solutions in daily life. This was the main reason many took the time and made the effort to be part of the conference. Ongoing community support is something greatly needed throughout the year. The importance for support and community is not only for those with chronic illness, but for all of us. We are not meant to travel the path alone. I tried it for some time and it is much more fun to be part of, rather than apart from. Take a look at who is in your circle of support. Are they living in the solution or focusing on the problem? Notice if you are a part of community or separate. If you are in need of more support, take one small step to reach out. You will find the full scoop here about how to cut through the B.S. can learn some downright useful tools. If you are interested in learning more, shoot me an email. If you already know you need to be part of a group committed to living in the solution, then go right to the details. Symphony or Soloist? You Get to Choose! The symphony was accompanied by three wonderful Broadway vocalists. As I listened and watched the full scope of what was happening, I was mesmerized. What struck me was how much there was to notice at the same time. When the vocalists joined in, the experience was exhilarating. You might be wondering what this has to do with my work in pain, and chronic illness. Think about how much there is to notice each and every second. Every moment there is a full symphony of sounds, smells, sensations, thoughts, emotions, and so on. Often we get caught up in focusing on only one thing, shutting out the rest, and leaving us missing out on most of what is in front of us. If I had only been focused on the pianist, I would have missed everything else. This relates to mindfulness – the ability to stay anchored in the present moment, expanding your awareness to all that is happening- without judgment. For example, at this very moment I am writing this newsletter, aware of fatigue in by body, my dog making noises, the cars passing by, my stomach rumbling, sensation in my hip, my mind wandering to the sunshine outside, my feet on the floor, and my fingers pressing the keyboard. I am sure there is more to notice, but you get the idea. If I got into judgment about any one of these, I would be missing most of my experience, because my mind would be somewhere in the future or past. It is a constant daily practice of noticing it all, anchoring yourself in the present moment. Let me be clear, it is noticing it all at the same time, not a game of ping pong – going from one thing to the other. Spring is a great time of year to begin to cultivate this approach. Take in the smells, colors, sounds, and sensations. When you are outside, engage your senses and see for yourself how much richer your experience is. Who knows, maybe you will notice an Easter egg hiding somewhere. Help… I’m Drowning in the Muck! When life get difficult and is filled with constant negativity, at some point you feel as if you were hit by a Mack truck. This is especially true for those dealing with chronic illness, difficult life changing events, or caregiving responsibilities. I would venture to say, everyone has experienced this from time to time.I experienced this recently. 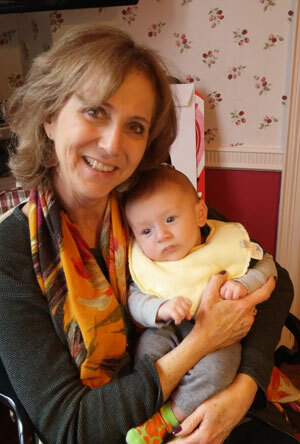 This past weekend I visited my mom and new great nephew in NY. AT 95, my mother watches all of the debates and reads the NY Times daily. She is amazing (and no, I do not have her great genes- I’m adopted!). I spent a lot of time keeping her company as she watched the debates. I also read more of the paper than I am used to. I noticed that my reactions to small frustrations escalated. The political climate is oozing with negativity and I was above my quotient. I was allowing myself to be “slimed” by negativity- if you watched the movie Ghostbusters, I wanted their de-sliming solution! I needed to find creative ways to cultivate a positive attitude, especially since I was not in the comfort of my home. The question is: How do we balance life when there is negativity looming around us? Escaping to a desert island sound compelling, but not practical. I am not advocating avioding or numbing – it is more about learning how to fill up while dealing with negativity. No matter how hard we try, constant negativity will get to us. The truth is, negativity breads negativity. One big area that helps me on a daily basis is doing or focusing on what I love. 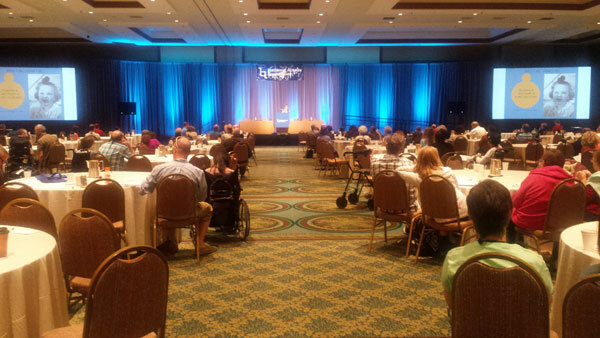 The Ataxia Conference in Orlando March 31- April 2. When the focus is on what makes my heart sing, negativity quickly transforms to joy and gratitude. Creating my newest program is my way of helping others to live in the solution and I have a blast teaching that. Remember this – no matter what is happening in your life or the world, bring your focus back to small steps to embrace what fills you up. I would love to hear what works for you. I Stand Corrected: I am an Overachiever, Underachiever! My last newsletter was titled I Am the Worst in Class: If you did not read it, check it out. After I sent the newsletter, I received this email from my older daughter:How much fun it that? If I am going to be a beginner, I am going to be the best damn beginner in the whole class. And I will write a newsletter about how excellent (expert, even) I am at being a beginner! I think you’re great! After I stopped laughing, my first reaction was one of elation- my daughter was reading my newsletters! Then I started thinking about her response. She had me pegged. I am still an overachiever even when I am the worst! I have to face the fact- I am not cured from perfectionism. We can easily be seduced into measuring ourselves to others and feeling less than. It is difficult to just be ordinary, part of the pack. I admit, using my jewelry class as an example is a stretch, but it reminds me of how many of us get caught in the spiral of wanting to be the best or extraordinary at something, and chase after the notion of what or where we should be. Even if we are really good at what we do, it is easy to find someone who is more successful and it robs us of feeling at ease with ourselves. I venture to say everyone deals with this. I have dipped into that space over the years and it is no fun. As for my jewelry class, I guess I knew I could not be the best, so I am mastering being the worst. Last week I broke 4 blades trying to saw my necklace shape. I guess having my beginning necklace be a circular shape was a bit overachieving after all! I do see other beginners in the class making mistakes. Now I can go and just be oaky- not the best, not the worst (still up for debate!) Just part of the pack. We all have areas where we excel and areas where we are not strong. When we accept that we are an ordinary part of the pack, we are able to relate more to others- a part of, rather than apart from. I will always strive to improve, and for now I want to improve just being Ellen- cute, messy, and fun! I Am the Worst in Class: How much fun is that? I had to write about my latest experience – maybe you can relate. My work with those dealing with high stress or chronic conditions include many techniques and perspectives. With all that I teach, there is one more ingredient that is vital to success: Finding balance by getting back to doing the things that we used to enjoy. Even if you are unable to do exactly what you used to enjoy, then dive in and try something new. I took my own advice (yes, I was out of balance) and signed up for a jewelry class. I had always wanted to try this and finally gave myself permission to commit my precious time to a weekly class. I signed up for a beginners class (an improvement for this overachiever!) I am learning how to light a torch, how to solder, make a bezel, sand down metal, cut out designs and more. In the class, there are many who have previously taken this class. I had to purchase materials and am happy to report that I did not invest in sterling silver (tempting as that was) for my first project, just to take the pressure off. Our first project was a simple ring, which went well except I jump every time I light the torch, and got tiny cuts from snipping the solder. 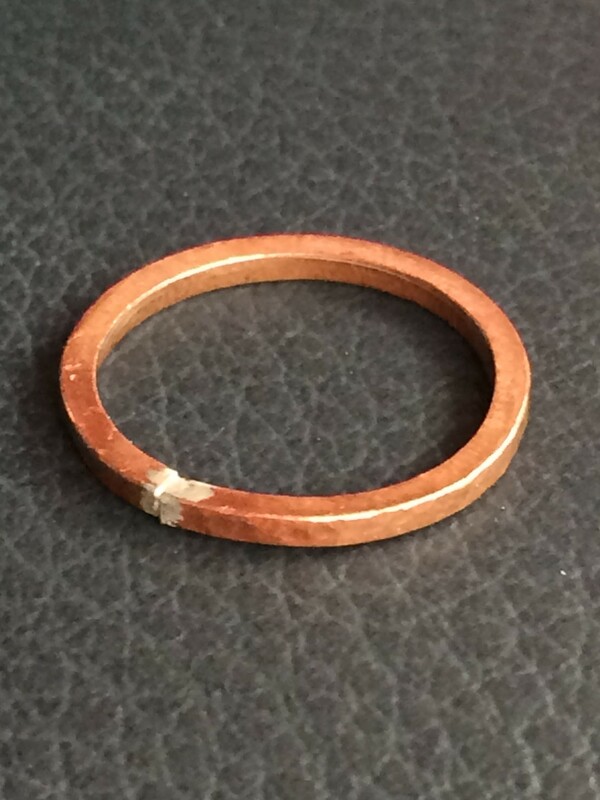 My first ring turned out well, with a decent soldering job and a bit of hammered texture. Feel like a kid in art class! I just finished my third class and must admit I still jump when turning on the torch, but no longer cut myself. Ahhh, making definite progress. I bring this up because I remember the last class I signed up for a few years back. It was a mosaic class with students at mixed levels of experience. Rather than picking a simple coaster for my first project, I decided that I could handle a Lazy Susan. That was not challenging enough – I made spiral designs. No wonder why I quit! My overachiever was alive and well, derailing me from enjoying myself. I remember a conversation with my older daughter. I was telling her that I wanted to learn to knit scarves and I was going to take a class. She laughed at me and said; “Mom, you will either quit in a week or open a knitting store!” She was correct – I quit after one lesson. I have learned a lot since then. I am now happy to be the slowest, least knowledgeable in the class. I am really having fun just being inexperienced me. After all, aren’t we supposed to have some fun without it being a contest of comparing, competing, and over achieving? When I allow myself to simply be a beginner, I am able to stay present with what I am doing while enjoying the process. I also love a challenge and always will, but allowing myself to balance work with play gives me more stamina and willingness to step up to the hard stuff. Begin to notice when you are comparing yourself with another. Also, notice when you are comparing yourself to your own high standards. What might happen if you allow yourself to just be where you are? I would venture to say that your experience will be much richer, less stressful, and enjoyable. Try it and see for yourself. Feel free to let me know how it goes. Nothing Exciting to Share – Now That’s Exciting! something funny and exciting to start the New Year. Then I dawned on me, there really wasn’t anything profound to tell you. I did take a family vacation in early December to the west coast.It is a rare occasion that my children and their significant others can get together. Nothing earth shattering occurred. We hiked, ate, swam, and basically chilled out. A wonderful time was had by all. After returning home, the holidays came and went and though much of it, I had a bad cold. My work was at a standstill was the Cancer Support Community closes the last two weeks of December and clients are busy. I dealt with insurance companies for hours on end (no excitement does not equal frustration!) Went to a few doctors, I watched mindless TV (love the Price is Right), slept late, waked the dog, meditated, read, saw my daughter, and hung out with Robert (in our new fireside socks) and the dog. As I write about this, it makes me re-examine excitement. I relaxed and slowed down. For a person who loves to feel productive, and be social, it took a lot of unwinding. I would venture to say many of us thrive on “doing” for many underlying reasons, probably the greatest being society’s value on success and productivity. Now that it is mid- January, I am finally writing a newsletter. I am sleeping a little later and taking more me time, letting go of trying to make something happen. Every so often my mind kicks in and tells me I am a lazy bones. It is good I know when my mind is messing with me. When that happens I acknowledge the feeling and do a few moments of breathing or meditation to reset my thoughts. So there you have it. Looking at what I wrote, I would say it is totally awesome just to be me not doing much. The best part is giving myself permission that it is okay. Not so easy, but quite exciting! Your Vacation: Leave yourself home and it will be great! Yeah, Summer Vacation is Here! Your vacation is around the corner and you are anticipating time filled with play, filling up, and chilling out. You leave your troubles behind- no work, no worries, no business calls (???) A change of scenery and recharge is around the corner. 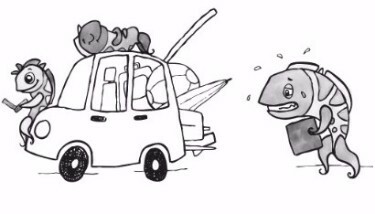 You plan, pack, buy new clothes, get your toiletries and are finally ready to get in the car, or get on the plane to your well planned destination. There is nothing in your way, except… Yourself! If you are perfectionist- you will want your vacation to go perfectly. If you are a complainer- you will complain about the weather, traffic, delays, food, etc. If you are a doer- you will be a busy bee with little down time- after all, you don’t want to miss a thing. If you are in a planner- you will miss out on spontaneity. You might be one or all of these. My husband and I recently took a vacation to Maine and Nova Scotia. We planned and booked our flights, our B&B’s, rented a car, and off we went. My husband has trained me that vacation begins once the door to our home closes (such a wise man.) The trip to airport, the drive to hotel is all part of the vacation. I have chosen to take that philosophy as well and it works beautifully. 1. The weather was not good for most of the trip. I had to constantly remind myself to let go of how I thought the weather would be and remind myself that the weather is not personal. Actually, the weather did not get in our way of what we wanted to do and my holding back on complaining (for the most part J) allowed us to have much more fun. 2. My “doing” personality was forced slowed down- we visited many beautiful sleepy towns. 3. I must add on an extra perk- The Food! Seafood… Memorable, delicious, and for the most part healthy. I think I took more pictures of the food than anything else! 4. Trip home- this could have really have put a damper on the last part of our vacation. We were delayed over 6 hours and did not take off from a small airport until 11:30 pm. I could have gotten frustrated, but instead I got out my Fit Bit and got someone’s child to join me and we walked over 3000 steps. His mom,brother, and my husband eventually joined us. I met some great people and joked and laughed. Delta, brought in pizzas and could not have been nicer. So what does this have to do with calm living? Since you cannot leave yourself home from your vacation, you can give yourself permission to shift one small habit. You will catch yourself in old behavior, which will give you a choice to make a shift. Maybe a simple breath is all that is needed when you catch yourself. Take a moment and notice how you show up to life. Find one area from my list (if you are the perfectionist, please only pick one) See what small shift you can make. Let me know how it goes. My Two Most Difficult Challenges: Change and Asking for Help! Change, change, & more change- That is the only constant in life. I see it happening all around me, but when it is my time to change I hold on, leaving claw marks. I know I am not alone in this. What it is about change that is so challenging and scary? While in the first few months of my leave, I tried a gentle yoga class and there my journey into the health and wellness field began. If you want to read more of that story, check out my bio page on my website. The reason I bring this up is to let you know that in the past year, I have gradually stopped enjoying much of what I am doing in my work. I used to love it, but I am burning out. I am clear that one big reason is that I am way too isolated and I can say without hesitation – isolation is the enemy. It is definitely mine. I spend much too much time with my dog. Although she is very quirky, sometimes inspiring, it is no substitute for human beings. I am a people person and love to be part of, not apart from. I have asked myself, what would I tell a client? I would tell them to be kind to themselves, remember what makes your heart sing and take small action steps. Hmmm, maybe I should hire myself! I began to explore what makes me light up and fill up in my current work. 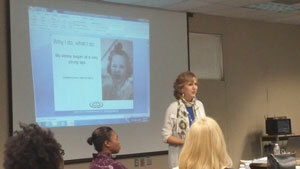 It is when I am speaking to groups, and teaching lunch and learn programs to organizations. I am eye to eye, relating to a group of people. I leave feeling exhilarated and am able to bring my fun, playful nature to this part of my work. I have resigned from the Chemotherapy center and will no longer take private clients. I will finish up the few private clients I am currently working with the passion I have always shown. I am still going to speak mostly to support groups, do book signings, and teach some lunch and learn programs for businesses. I will still write my newsletters – That is it. I know that I love to be busy and have fun, so I am not ready to retire and probably will never be ready. I am looking to work with or for someone. Yes, a job! Here is what I bring to the table and what I am looking for. Maybe you know someone you can introduce me to. It does not have to be health and wellness- my background of stress management is valuable in any job. “I met this woman once. Spent about 2 hours with her. And won’t ever forget her. That’s just the kind of impact she has. Bright. Witty. Intelligent beyond measure. I am filled with gratitude for what I have done and the people I have met. I look forward to seeing what my next adventure will be. Stay tuned. In the meantime, I will stay in touch, and hope you will, too. My NY Bagel Debacle: Never Again! Recently both of my daughters and myself flew to NY to spend Mother’s Day with my mom. It was a treat to have us all together with my sister and brother and their families. Of course no NY visit would be complete without NY Bagels. If you are from the south and you think the bagels here at the chains are good bagels- you are mistaken. Most of their bagels are baked and I refer to them as “rolls with holes”. They are yummy, but not a true bagel. Bagels are boiled, not baked and what makes NY bagels superior to a real southern bagel is the water they are boiled in. 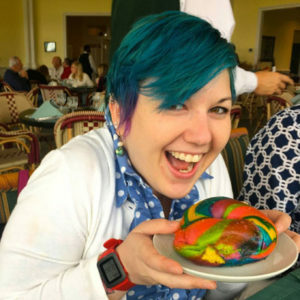 NY Bagels can even be colorful- a perfect match for my younger daughters hair! Enough about your bagel lesson. What I want to share is a lesson I learned about the power of the bagel. Before we left we visited our favorite bagel shop to purchase bagels to take home. My daughter was giving a dozen bagels as part of a house warming gift. All together we bought two dozen. Since two dozen bagels are quite heavy, I got the bright idea to wrap them very well, pack them, and send them through luggage. All went well and our precious bagels arrived safely in Atlanta. The problem arose when I opened my suitcase. The smell of the well packed onion bagels satiated every last item in my bag, including my bag! I had to take the bag out of our bedroom as it was stinking everything up. I proceeded to wash everything, even my raincoat. Still a mild smell. I wiped out my bag with a surface wipe which did not help. Still onion smell. The icing on the cake (or bagel) was what happened the following morning when I went to open my makeup case, which smelled of bagels. When I applied my foundation, there was an odor coming from my makeup brushes-onions. Today I went to the store and bought heavy duty Mr. Clean- success at last! I can finally store my suitcase. As for my makeup brushes, a quick washing will hopefully work. If you are around me and smell something mouthwatering, it is my new scent- Ode de NY Onion Bagel. For me, I have gained even more respect for the NY bagel. They do not skimp on the onions! The past few weeks have been very difficult for our family. My brother-in-law passed away unexpectedly. In addition to grief and sadness, something else got my attention. My husband’s sadness was compounded by the reality that he waited to go to his dentist brother to fix his teeth. He kept putting it off partly because he hates going to the dentist and partly because he felt he could do it any time. Sadly, anytime will not come. This brings to mind an experience my mother had when her friend died- she regretted not having her to her house for a visit. She kept putting it off. Unfortunately these are not isolated incidents – we all do this. We wait to feel better to do something uplifting. We wait until our kids leave for college to do what we want. We wait for a better time to take a vacation. We wait to take the class we have wanted to take. 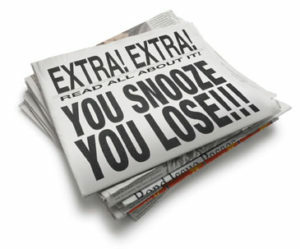 Let me sum up waiting: You snooze, you lose! I still find myself waiting and I am going to stop the B.S. right now and make a commitment. I have put off the formal launch of my new program The No B.S. Calm Living Book Club, waiting for the best time. You know what the best time is? NOW! How to go from knee jerk reactions to calm, focused solutions. It all happens on May 18th from 7-8 pm EST. Don’t Wait! All you do is CLICK HERE to reserve your seat. You will be glad you did. After all, free is an offer that you can’t resist. Contact us for speaking events and programs for groups and individuals. Wow, Staggering Statistics about Autoimmune Disease! No B.S Stress Buster Technique of the Week: Yikes! Who am I now? Meditation in a Car Wash? That sounds crazy! And receive a free gift – From Chaos to Calm in 30 Seconds! Find out how to get out of chaos — or learn to avert it altogether.